Ever laugh at a funny cat video? Find out the link between feline antics and your memory, according to research at California’s Loma Linda University. Can a dog help you recover from surgery? Learn what Loyola University research revealed about animal therapy and joint-replacement. Who are Tibby and Spirit? Two of the 4 dogs and 6 cats benefiting residents at Kendal at Oberlin. Read how. See their furry faces! 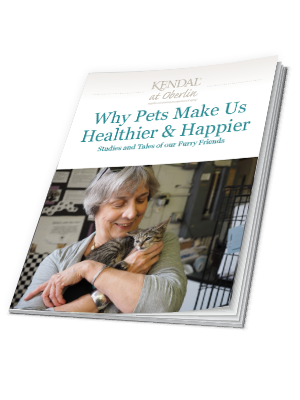 Get our eBook Why Pets Make Us Healthier and Happier, Studies and Tales of Our Furry Friends to find out the health secrets your pet may hold!